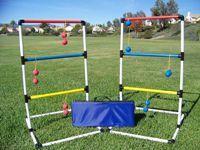 Ladder toss is a lawn game played by throwing bolas (two balls connected by a string) onto a ladder. Also called Hillbilly or Polish Horseshoes. Each ladder has three rungs, each rung scoring a different point value. One common method of scoring is to have the rungs be one, two and three points. In one variety the top is worth 1, middle is 2, and bottom is 3. Points are tallied at the end of each round, after all teams have thrown their bolas. The bolas suspended on the ladder score the points for that rung, often with the goal of getting at least 21 points to win.